Misericordia University's accelerated degree programs are offered in a variety of formats including predominantly online, on-campus, evening and weekend classes at our Nanticoke and Scranton locations. A review of your transcript will determine which courses completed at other institutions are equivalent to the course requirements of your chosen major. In addition to completing the major courses, you will be required to complete additional liberal arts electives as part of the core curriculum. For more information, please contact the Admissions Office at (570) 674-6791, toll free at 1-866-262-6363, or e-mail admissmu@misericordia.edu. The curriculum of the accounting major is offered primarily online and is designed to provide individuals with communication, critical thinking, and analytical skills, as well as the technical proficiency to become professional accountants. The American Institute of Certified Public Accountants and other accounting organizations continually emphasize the value of a broad approach to education. The liberal arts core and business courses that are required of all accounting majors address this need and help individuals acquire the necessary skills that will contribute to a productive life and satisfying career. Accounting courses also integrate an extensive use of computers and standard business software into instruction and student assignments. The Accounting program is accredited by IACBE. View the courses required for the Accounting Major. The Business Administration Major with a sequence allows students to focus on areas such as management, marketing, management information systems, or health care management to fashion their study to meet their professional and personal needs. The curriculum contains sufficient flexibility to meet most needs and expectations of the students, both those who intend to go on to graduate school and those who seek immediate entrance into the profession. Classes are currently offered online, as well as at our Nanticoke and Scranton locations. The Business Administration program is accredited by IACBE. View the courses required for the major in Business Administration. View courses required for your desired specialization in the Business Administration Major. The Diagnostic Medical Sonography Bachelor Degree, is designed as a continuation of education for practicing sonographers whose personal and professional goal is to attain a degree and/or advance in their career. Given the complexity of the profession with credentialing in multiple specialties, this degree offers the opportunity to become knowledgeable in additional specialties, social sciences and/or leadership skills. In addition, through our liberal arts curriculum, students will develop the global perspective for the graduate to be effective as a professional in an ever-changing healthcare system working with an increasingly diverse population. Sonographers who desire to further their education regardless of previous sonographic educational background. Sonographers who seek to broaden their employment opportunities. Sonographers who may have a goal of attaining a master's degree in the future. View the courses required for the Sonography Major. The GLNS program equips graduates with a solid academic foundation for entry-level career employment and mid-level career mobility opportunities in broad areas of criminal justice, public safety, security services, government and court administration, and legal services. The curriculum is designed for professional first responders, including municipal police officers, public safety agencies, emergency management personnel, state and federal law enforcement, homeland security organizations, and local, state and federal government and court administration. The GLNS degree seeks to assist those already employed in the field to improve their educational background and skills, thereby increasing job mobility. In addition, GLNS prepares students for graduate study in law, government administration, business and national security studies. View the courses required for the GLNS Major. The Health Care Management major is designed for the early to mid-career business professionals or health care clinicians interested in changing or advancing their careers.Students in the program will learn management skills, leadership development and specific areas of health care finance and reimbursement, marketing, health care law, and strategic planning from faculty who are senior managers in health care and experts in their field. View the courses required for the Health Care Management (HCM) Major. The Bachelor of Health Science with a Specialization in Respiratory Therapy is designed as a completion program for students to augment student knowledge in the health/fitness/wellness field. The courses in the specialization area are a combination of in-class face-to-face courses and online courses. Students have the option of all online coursework. Applicants must have completed all respiratory science requirements for board certification as part of an accredited associate degree program, and must have approval from the accrediting body to take the board examination prior to matriculating into the completion program. Click here for more information regarding the BS in Health Science: Respiratory Therapy Specialization. View the courses required for the Health Science: Respiratory Therapy Specialization. The Bachelor of Health Science with a Specialization in Surgical Technology is designed as a completion program for students to augment student knowledge in the health/fitness/wellness field. The courses for the specialization area are a combination of in-class face-to-face courses and online courses. Students have the option of all online coursework. Applicants must have completed all surgical technology requirements for board certification as part of an accredited associate degree program, and must have approval from the accrediting body to take the board examination prior to matriculating into the completion program. Click here for more information regarding the BS in Health Science: Surgical Technology Specialization. View the courses required for the Health Science: Surgical Technology Specialization. The information technology curriculum models the recommendations of the Association of Computing Machinery and provides career-oriented education with a strong liberal arts program. The information technology major leads to a bachelor of science in information technology. The program prepares students to pursue careers in scientific or industrial programming and systems analysis, or to continue their education at the graduate level. In addition, a student may elect to do a specialization in IT Security. Technology is always changing; therefore, the program has a strong foundation of knowledge to keep pace with trends in technology. The major goes beyond basic programming to include project implementation, computer architecture, and more. It is concerned with issues of how information technology can assist an organization meet its goals. Students learn how to select, create, apply, integrate and administer technology in an organization. View the courses required for the Information Technology Major. 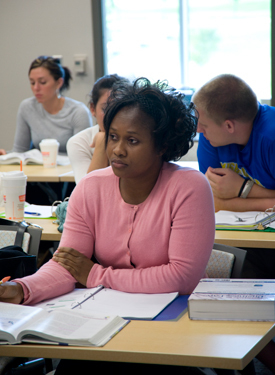 The RN to BSN program is based upon the tenets of the Pennsylvania Statewide Articulation Plan (1993). A total of 126 credits are required for the Bachelor of Science degree in Nursing for RN students. These credits are earned through matriculation credits (i.e. course work at Misericordia); transfer credits from approved two- and four-year colleges; and advanced placement credits. Advanced placement credits include 32 credits for course work completed in a state-approved and NLN-accredited associate's degree or diploma program in nursing. View the courses required for the RN to BSN Major. The Accelerated Bachelor of Science in Nursing (ABSN) is designed for career changers and recent college graduates who desire to transition into the nursing nursing profession in as few as 16 months. The full-time ABSN program blends online coursework, onsite skills labs and clinical rotations at top hospitals in Pittsburgh. The ABSN program comprises a minimum of 126 total credit hours, which students earn through prerequisite course prior to enrollment as an ABSN student, core nursing courses as well as articulation credits (i.e. coursework at Misericordia) or transferred core credits from approved two- and four-year colleges. Students in this program will also receive 675 total hours of clinical education. View the courses required for the ABSN program. Total Credits for Degree Completion: 126. The professional studies program was created to provide the opportunity for students who have previous or university credits in career oriented programs to earn a bachelor's degree through additional study at Misericordia University. Professional course credits completed in prior study can be combined with additional credits and will qualify the candidate for the bachelor's degree. The degree obtained may be a bachelor of science or a bachelor of arts, each with a major in professional studies, depending on the courses completed. Individual programs of study are designed by the student with the assistance of the program director. At least 30 credits must be earned in upper-level courses. In addition, at least 30 credits must be earned at Misericordia University. These two requirements may be satisfied by the same 30 credits. Completion of the core curriculum is required either directly or by reasonable substitute as prescribed by the Registrar in the course of transcript selection. Continuation as a professional studies major requires a 2.0 average. The Mission of Misericordia University's Social Work Program is to prepare students for entry-level generalist social work practice with individuals, families, groups, communities and organizations. Inherent within this mission is a commitment to the development of BSW graduates who are dedicated to improving social, economic and environmental conditions among diverse populations and to promoting the Sisters of Mercy values of mercy, service, justice and hospitality. Visit the Bachelor of Social Work Accelerated Degree Program webpage for additional information. The Addictions Counseling Certificate is designed to prepare graduates to work with the myriad of problems associated with chemical addictions. Substance abuse and addictions are among America's most devastating and pervasive social ills. Addiction respects neither age nor socioeconomic status and impacts on individuals, employers, families, and friends as well as the interrelationships of our most basic societal institutions. Its effects are also visible within many other social problems including crime, delinquency, and family violence. Visit the Addictions Counseling Certificate webpage for additional information. The certificate program in Autism Spectrum Disorders (ASD) under the College of Health Sciences and Education will prepare students and professionals to work with clients diagnosed with ASD. The certificate program in ASD will provide prospective students with current evidence-based practices, knowledge, and program development in the area of ASD within their respective fields. After completing the coursework within the certificate program in ASD, students would qualify to sit for the Autism Competency Exam to earn an Autism Certificate or become a Certified Autism Specialist through the International Board of Credentialing and Continuing Education Standards (IBCCES). This is a 3 course sequence for Professional Development Credits (Act 48 eligible) that will prepare students and professionals to work with clients diagnosed with ASD. The certificate program in ASD will provide prospective students with current evidence-based practices, knowledge, and program development in the area of ASD within their respective fields. After completing the coursework within the certificate program in ASD, students would qualify to sit for the Autism Competency Exam to earn an Autism Certificate or become a Certified Autism Specialist through the International Board of Credentialing and Continuing Education Standards (IBCCES). Visit the Autism Spectrum Disorders webpage for more information. Features a fieldwork experience in which students observe, interact with patients and other health care professionals, participate in the effective progression of patients throughout the care process, and learn about effective patient-practitioner communications and the self-management of patient care. Currently a 50% increase between 2016-2024 in the need for patient navigators in health care systems, insurance companies and physician offices. In Pennsylvania, the state Department of Labor & Industry predicts an average of more than 1,300 job openings annually in patient navigation and related fields, according to Hanover Research. Demonstrate an understanding of the patient care process from a social justice perspective. Demonstrate critical reasoning skills in the patient care process by conducting a client assessment, identifying functional problems, and developing an appropriate intervention plan. Interact and communicate professionally and courteously with clients while demonstrating the necessary clinical competencies required within their respective health care discipline. Federal aid is available for those who are eligible. Click here for more information pertaining to the Patient Navigation Certificate program.